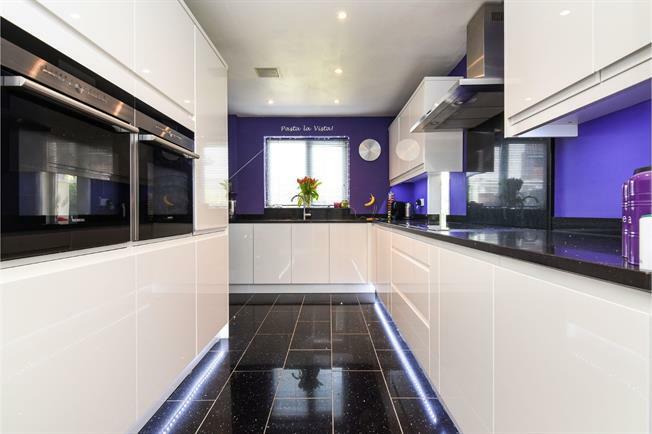 4 Bedroom Detached House For Sale in Basildon for Price on Application. FEATURED IN THE BIG OPEN HOUSE EVENT -Located in the highly sought after Presidents Estate in Laindon West. Perfectly situated in close proximity to transport links with Laindon mainline station offering access to London or Southend. While the A127 is a few moments away and offers connectivity to London, the M25 or Dartford Crossing. Other local amenities include a superstore and Great Berry Primary School with an outstanding Ofsted score in close proximity. This delightful family home offers any young family a generous amount of living space with 3 reception rooms its perfect for entertaining friends and family. With under floor heating spread through the lounge and dining room creating a lovely warm and welcoming feel to the rooms. The ground floor also offers a downstairs WC, utility room and a fitted kitchen with integrated appliances. With 4 sizeable bedrooms this property is perfect for any growing family and has a wealth of fine features and the added benefit of a loft room which can be used as an office space. Externally the property has a larger than average garden with a stunning decking area perfect for a summer evening and BBQs. Laminated wooden floor, radiator, textured ceiling, flush light fitting, coving. Laminated wooden floor, radiator, built in under stairs storage drawers, smooth plastered ceiling, recessed spotlights, coving. Textured ceramic tiled floor, radiator, base and wall units, laminated wood L-shaped work top, space for washing machine, space for tumble dryer, space for dishwasher, wall mounted coat rack, textured ceiling, spotlight light fitting, coving, door through to gym/garage. Laminated wood flooring, electric under floor heating, digital heating control panel, white wooden Venetian blind, smooth plastered ceiling with recessed spot lights, recessed stereo speakers, coving, glazed double doors through to dining room. Laminated wood flooring, electric under floor heating, digital heating control panel, smooth plastered ceiling with light fitting and recessed corner spotlights, recessed stereo speakers, coving, external door through to conservatory. Textured ceramic tiled floor, ceiling fan and light fitting, external double doors through to decking. Painted wooden floor, radiator, micro blind, built in wardrobes with sliding mirror doors, textured ceiling , spotlight light fitting, coving. Laminated wood flooring, radiator, micro blind, textured ceiling, spotlight light fitting, coving. Laminated wooden flooring, radiator, metallic micro blind, textured ceiling, spotlight light fitting, coving. Laminated wooden flooring, radiator, textured ceiling, spotlight light fitting, coving. Ceramic tiled floor, large shower cubicle, corner basin with chrome mixer tap, low level dual flush toilet, chrome towel radiator, smooth plastered ceiling, recessed spotlights, coving. Carpet, built in banister DVD shelving, linen cupboard, smooth plastered ceiling, feature pendant light fitting, coving.